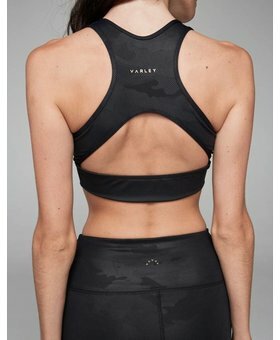 The Varley Brighton Sports Bra Taupe Snake is a modern shape & contouring V-style racerback bra with a feminine touch that is supportive, comfortable and stylish at the same time. This bra was created in Varley's new Flow Fabrication that is buttery to the touch, and ultra soft. It is designed to hold you gently all the way from downward dog to a headstand. Double set of back bands offers light but essential support. Perfect for barre, yoga, pilates and high intensity activities.